Attention Guests- Our hotel will be undergoing renovations beginning September 26- 2016 and end on December 1- 2016. We apologize in advance for this inconvenience and we appreciate your patience as we work to improve our property for your future enjoyment This Property is 100 Pct. Non-Smoking The Homewood Suites By Hilton HOU Intercontinental Airport hotel is a beautiful 64-room property which opened in the summer of 2003. 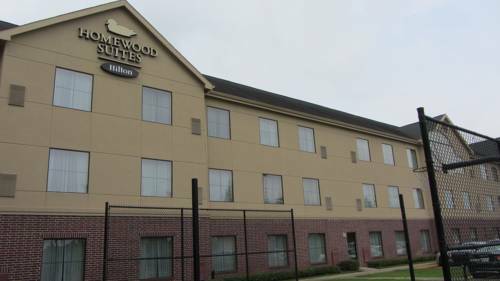 The Homewood Suites Airport hotel in Houston Texas is conveniently located only two miles from the Houston Bush International Airport and in the hub of the Greater Greenspoint Corporate District. All suites in the Homewood Suites Airport hotel in Houston Texas have deluxe king or queen beds sleeper sofas work space with two phone lines voicemail and complimentary high-speed internet access. Perfect for the short or long-term traveler each suite has a fully equipped kitchen and two cable televisions. Guests of the Homewood Suites Airport hotel in Houston Texas can lounge outside by our pool and hot tub or unwind by playing basketball or volleyball on our sports court. A daily Suite Start hot breakfast and an evening Welcome Home reception Monday through Thursday are also some of the wonderful features of the Homewood Suites Airport hotel in Houston Texas. Stay a day or stay a month -- whatever will work for you. Just know the Homewood Suites hotel is truly your home away from home. Make Yourself At Home.